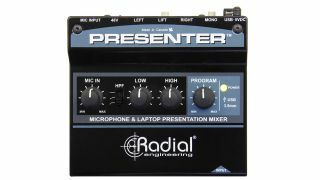 The What: Radial Engineering has introduced the Presenter, a compact mixer that combines a microphone preamp and a USB or 3.5mm program input for an interface for presentations, from school lectures to corporate audio. The What Else: The Presenter features an XLR mic input to connect an external/podium microphone and provide it with phantom power. The mic signal can then be adjusted using three EQ controls: a high-pass filter rolls off excessive low end, and low and high knobs allow users to tailor the frequency response. A USB program input on the back of the Presenter provides high-quality audio playback from a laptop, perfect for presentations that include audio or video files, or for DJ applications. The USB input also provides power for the Presenter, eliminating the need to carry around a separate power adapter. To connect the output from a portable device such as a smartphone or tablet, a 3.5mm TRS connector is built into the front panel of the Presenter, and is controlled using the same level knob as the USB audio input. The Presenter automatically senses when the 3.5mm input is in use, and mutes the USB signal. Once the smartphone is disconnected, it automatically switches back to the USB connection for seamless playback. This allows “aux-cord DJs” to be easily accommodated during weddings or other events. Both the microphone and playback signals are mixed to stereo XLR balanced outputs, which can be connected directly to a PA system or a pair of powered speakers. A mono switch is provided if only one speaker is needed, and a ground lift helps ensure that the output signal is clean and free of any buzz or hum from ground loops. The Bottom Line: The Presenter provides a simple solution for events where a microphone and a playback source need to be mixed together and sent to a sound system. School presentations that require the audio output from a laptop, weddings, and events that feature an MC and music playback from a DJ or from guests' smartphones, and speaking engagements that need to be recorded to a laptop are all examples for which this device is well suited.